An incredible Paleo pumpkin bar slathered in a low-carb maple brown butter cream cheese frosting! Who said delicious food couldn’t be healthy?! We have made these amazing bars more times than I like to admit. Like A LOT. But I don’t have to admit that. Really. I could say it was because I wanted to make extra sure they recipe was spot on…..but I knew that after 2 attempts! The real reason is that they are pure pumpkin perfection. And the brown butter frosting? Well…it’s nothing short of amazing! The texture? A perfect, light, and cakey crumb with just enough moisture. I swear, the best bakery could not have a better cake crumb…and in this case totally grain free!!! The flavor? Well the brown butter frosting has this lovely caramel overtone from the brown butter addition. It was really a spontaneous addition because I keep brown butter on hand to use in just about any place I can think to use it….it’s pure awesomeness (learn how to make brown butter here)!! And the maple and brown butter together? Well, let’s just say it’s a flavor match made in heaven and that everyone needs to try it just once in their life if they can! I primarily eat lower carb now, so I am taking older gluten free recipes and converting them to lower carb counterparts. In this case, I did just that. While certainly not zero carbs, it is lower carb than you average baked good….and it uses all wholesome, real food ingredients…so it almost counts as a health food! I have heard good things about Kite Hill Almond Cream Cheese, as well has other vegan brands. And honestly, any favorite frosting would work here. Or no frosting at all. Or mix in some chocolate chips and call it a blondie. Really…make it work for your restrictions! And if you love pumpkin as much as we do, take a minute to peruse my over 30 recipes that include pumpkin as a star ingredient!! Because really? 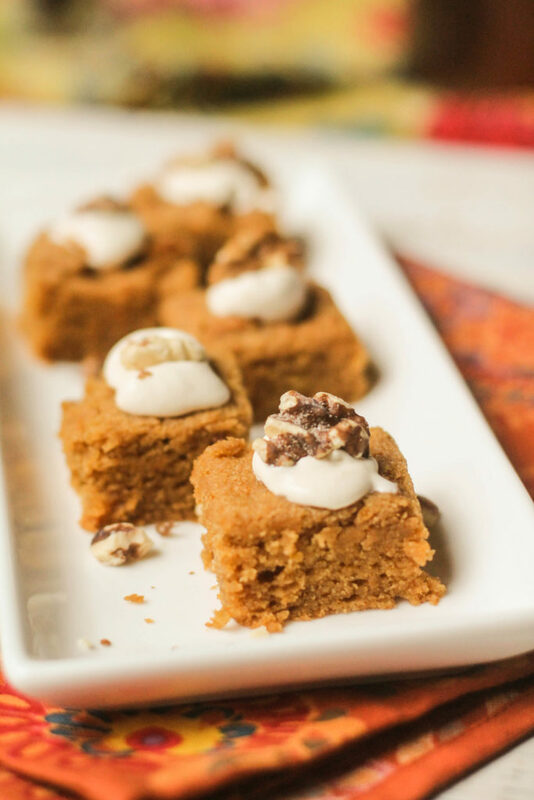 There is always a good reason to break out the pumpkin whatever time of year it is, and these pumpkin bars will not disappoint! Preheat oven to 350 degrees, grease an 11 x 7 glass pan. In the bowl of a mixer, cream the softened oil, pumpkin, and sugar. Cream in the eggs and vanilla. With the mixer running, sprinkle in the baking powder and sea salt. Spread batter into the greased pan, and place in the oven to bake for 20-25 minutes. When a toothpick inserted in the middle comes out clean, they are ready. While they cool, place all the frosting ingredients into the bowl of the mixer, or use your Blend-Tec Twister Jar. Taste and add additional sweetener if you feel like it needs it. These were not bad, but the bars are pretty bland, and I didn’t think the brown butter flavor was particularly complimentary here. Adding spices is always an option…we love this way, but everyone has different preferences. Thanks Cara. 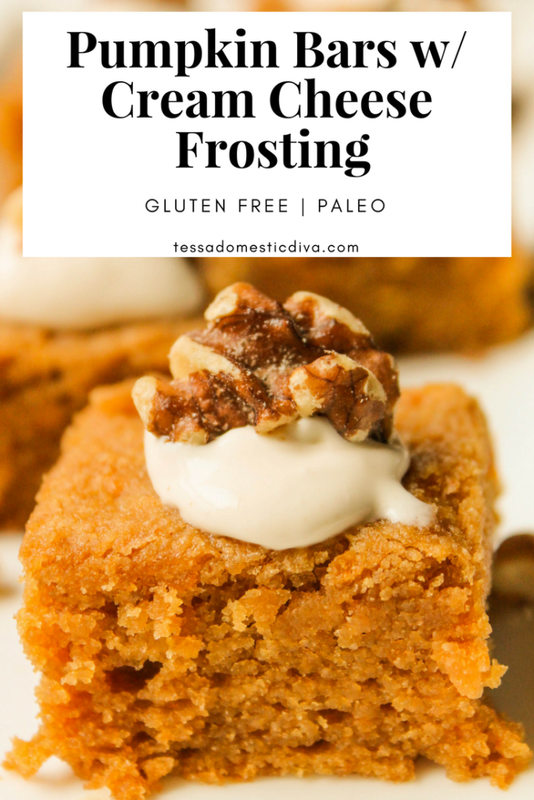 I’m always on board with cream cheese frosting, but made with browned butter… Oh My Goodness that looks amazing! Kite Hill is so delicious! These are perfect for fall! Thank you! They look so moist and delicious! Love it’s low carb, too. Fabulous! There is just nothing like the flavor combo of brown butter and pumpkin. That frosting looks amazing and my family would just devour this! I love all things pumpkin. These look so moist and delicious. YUM! Yummo! These are really tasty (maybe a little too much so). Thanks for sharing this recipe. Oh, heck yes. I’m seriously drooling over these! I have to have some kind of pumpkin dessert every Fall and these may need to happen in my kitchen. You have me swooning over that frosting! It’s so special with the brown butter and so perfect on these pumpkin bars – yum! Those look perfectly delicious. I love pumpkin anything, and that glaze sounds like a wonderful addition! The texture looks so good!!! I love that you use a vobo of cassava and almond flour…I have both and can’t wait to try these! YES! There are so many dairy-free alternatives for butter now – you mention one of my favorite, Kite Hill! Miyoko’s also has a cashew-based butter that’s out of this world! If you’re looking for Stevia-flavored maple “syrup” look for NuNaturals that came out with a pourable maple flavor! 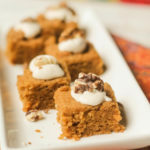 As a lover of everything pumpkin I give this recipe two thumbs up! I will be making these for the family soon! Sounds like a delicious treat to kick off fall and all things pumpkin-y! Alexa had so much fun looking at your blog. 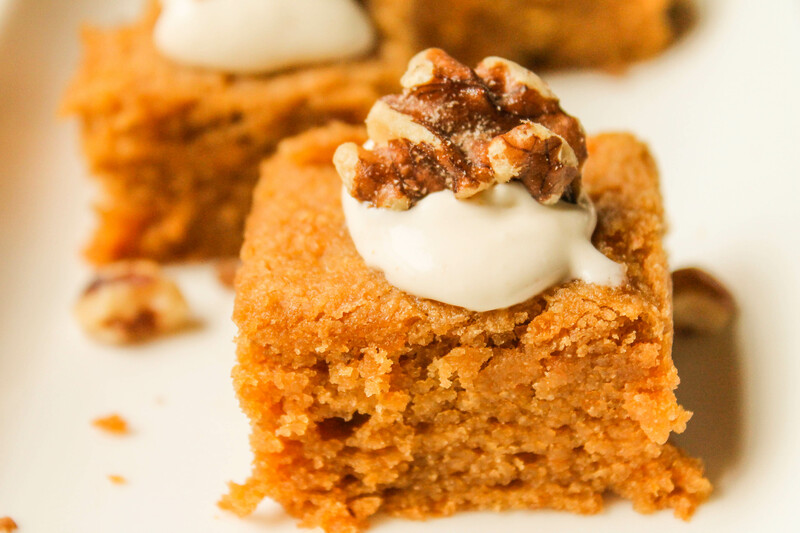 We are going make your Pumpkin bars tomorrow. Oh My Goodness Tessa, these look A-Mazing!!!! I might try these with an egg replacer and I’ll let you know how they turn out! These look INCREDIBLE! No one will ever know they’re being healthy (even my kids!) This one is going on my to do list now! Then that would be a success Karly! Sneaky Moms unite! Good recipe to use up the pumpkin flesh from the pumpkins for halloween. The butter frosting looks so tempting! It IS tempting….a huge reason these disappear so quickly in our house!! thanks Leo!